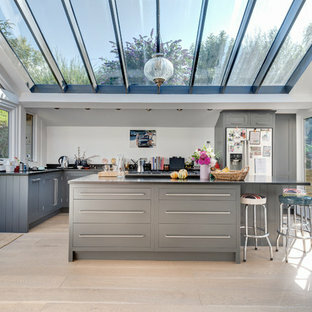 Photo of a large contemporary kitchen in London with flat-panel cabinets, grey cabinets, an island, black appliances, grey floors and black worktops. 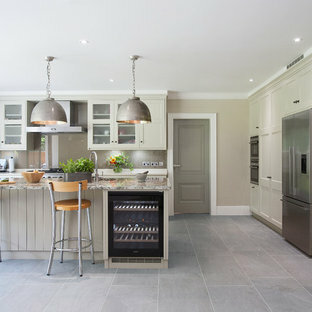 Design ideas for a classic kitchen in Surrey with recessed-panel cabinets, grey cabinets, grey splashback, glass sheet splashback, stainless steel appliances and an island. 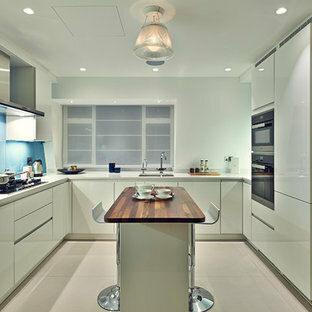 Photo of a medium sized classic single-wall kitchen in London with a belfast sink, shaker cabinets, blue cabinets, white splashback, ceramic splashback, stainless steel appliances, light hardwood flooring and an island. 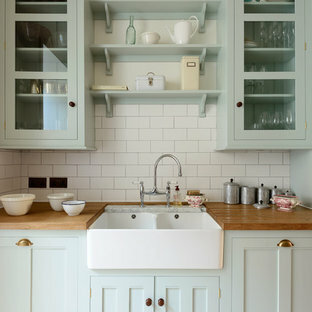 Design ideas for a medium sized classic single-wall enclosed kitchen in London with beaded cabinets, blue cabinets, wood worktops, white splashback, metro tiled splashback, stainless steel appliances, light hardwood flooring, no island and a double-bowl sink. 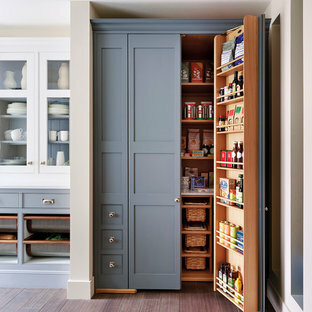 This is an example of a romantic u-shaped kitchen/diner in Kent with flat-panel cabinets, white cabinets, stainless steel appliances and painted wood flooring. 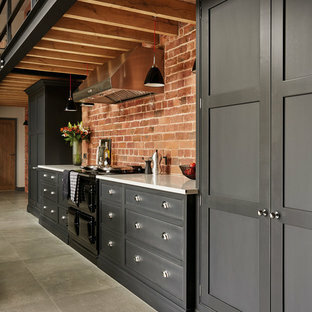 This industrial inspired kitchen is painted in Tom Howley bespoke paint colour Nightshade with Yukon silestone worksurfaces. The client wanted to achieve an open plan family space to entertain that would benefit from their beautiful garden space. 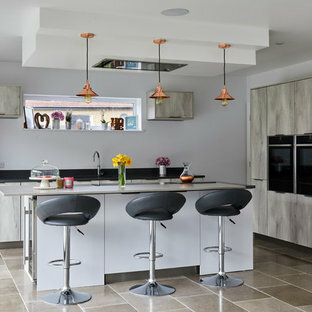 Medium sized classic kitchen/diner in Cheshire with a submerged sink, grey cabinets, white splashback, raised-panel cabinets, marble worktops and an island. 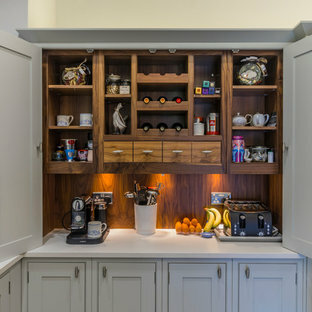 The clever combination of Oak worktop and integrated bin cabinet below, provides a brilliant food preparation area. When you are finished chopping vegetables just slide the rubbish straight into the bin. 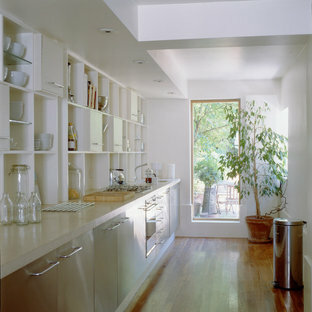 Inspiration for a contemporary galley kitchen in London with a submerged sink, shaker cabinets and blue cabinets. 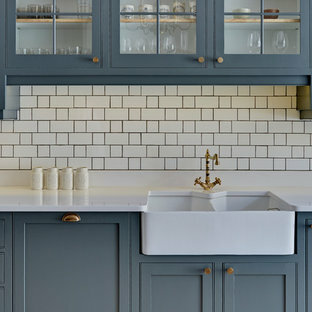 Inspiration for a classic l-shaped kitchen in Dallas with a belfast sink, recessed-panel cabinets, black cabinets, white splashback, mosaic tiled splashback, stainless steel appliances, medium hardwood flooring, an island, brown floors and white worktops. 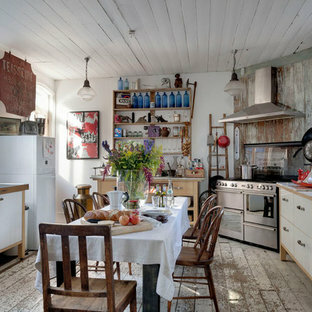 Inspiration for a classic l-shaped kitchen in Orange County with shaker cabinets, white cabinets, white splashback, stainless steel appliances, medium hardwood flooring, an island, brown floors and white worktops.